PVC flat roofing, otherwise known as vinyl roofing, is very durable and stable. However, even the best materials eventually require a repair. Read on to learn the main reasons for PVC flat roof failure, and how to fix them. PVC roofing is relatively easy to repair, and it's rare to have to replace an entire vinyl flat roof until it reaches the end of its lifespan, which averages 20 years or more. That said, no roof is immune to problems, and below you'll find some of the main reasons why your PCV roofing might need some TLC. Today, almost all PVC flat roofing is reinforced with a "polyester scrim," or thick woven fibers, to improve its weatherization. Unfortunately, many older vinyl roofs lack this addition. This means that in very cold weather, a vinyl roof could crack and shatter just from being stepped on. PVC roofing is also relatively puncture resistant, but it’s not impermeable. Dropped tools or sharp broken branches could tear or puncture the membrane, leaving your home vulnerable to leaks. As tough as a PVC roof can be, it still has a major Achilles heel: asphalt. Vinyl roofing combined with asphalt is bad news, and both materials will be damaged when the two come into contact. PVC will discolor, become stiff, and age prematurely, while asphalt will soften and begin to bleed. Overall, keeping these materials away from each will avoid an unnecessary and annoying repair. The major advantage of PVC flat roofing is its heat-welded seams. This addition ensures greater flexibility over time and through varying temperatures. However, if the seams are improperly welded, holes will emerge and will allow water to seep into the roof deck. Often, a simple patch should repair problems like cracks or holes. Before patching your roof, first make sure the area is completely clean by using an acetone based cleaner (oil based cleaners can degrade the vinyl). 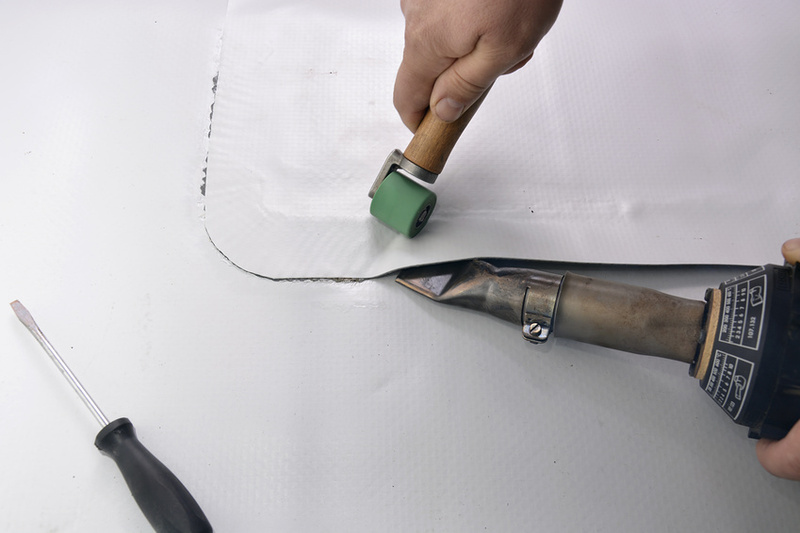 Then, adhere a special PVC patch using an air welder and a roller, firmly pressing the patch over the problem area. If running asphalt is the problem, then you have two options. If you notice the problem immediately, it's possible to clean the asphalt off the vinyl roof using a non-solvent based cleaner, such as DeWitt’s Remove-It Citrus Spray Cleaner. A solvent based cleaner will simply degrade the vinyl further. However, if the problem is not taken care of immediately, the asphalt will be impossible to remove. In this case, the entire damaged area must be removed and welded with a patch. If the problem is extensive, you might need to completely replace your PVC roof. Usually, poor installation techniques are the main reason behind PVC flat roof membrane failure. All of the above-mentioned problems can be avoided by ensuring you hire a qualified professional experienced with flat roofing, so make your PVC roof repair easy by hiring a superior roofing contractor today.